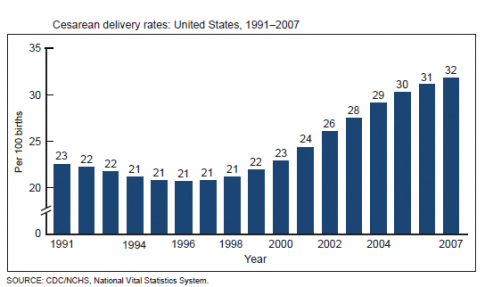 The National Center for Health Statistics released a new report Monday, Recent Trends in Cesarean Delivery in the United States. The report is most notable for a startling statistic: The C-section rate has reached the astronomical level of 32 percent, an increase of more than 50 percent since 1996. This is disturbing news. Although there are often clear clinical indications for a cesarean delivery, the short- and long-term benefits and risks for both mother and infant have been the subject of intense debate for over 25 years. Cesarean delivery involves major abdominal surgery, and is associated with higher rates of surgical complications and maternal rehospitalization, as well as with complications requiring neonatal intensive care unit admission . In addition to health and safety risks for mothers and newborns, hospital charges for a cesarean delivery are almost double those for a vaginal delivery, imposing significant costs. It's true that there is no correlation between numbers of lawsuits and the C-section rate. In addition, there is no correlation between the size of monetary awards and the C-section rate. There is a correlation between malpractice premiums and the C-section rate, but the association is not dramatic. So how could the C-section rate be tied to liability concerns? Of the 9 most common reasons for obstetric malpractice suits, 6 (#3-#8) allege failure to perform a C-section or failure to perform a C-section sooner. In other words, performing a C-section when there is any doubt about the baby's health, or even before there is any doubt, will virtually eliminate the chance of being sued successfully in connection with the delivery; it might even make a lawsuit less likely if the plaintiff cannot argue that a C-section should have been performed. The C-section rate is skyrocketing primarily for non-medical reasons. While doctors blame the tort system as the proximate cause, the fundamental cause rests with patients, not lawyers or insurance companies. The fundamental cause is an inability to tolerate any risk to a newborn. In the current legal climate, there is no possible justification for not doing a C-section, regardless of how tiny the risk posed by vaginal delivery may be. Unless and until people stop penalizing doctors for not doing C-sections, they will continue to do them in ever increasing numbers. They really have no choice. You cannot say to obstetricians, "Give me a perfect baby or I will sue you for failure to perform a C-section" and then express shock and dismay that obstetricians will perform C-sections in order to guarantee that you will have a perfect baby. The sky high C-section rate is the all too predictable result of parental expectations. As long as parents continue to sue for failure to perform a C-section, the C-section rate will continue to rise.